Itchy, flaky skin, nosebleeds and chapped lips are all signs that your environment is too dry. One time-honored method of relieving these ailments relies on a machine invented more than 100 years ago: the humidifier. Today's humidifiers are quite a bit more advanced than the first models patented in 1896. Modern humidifiers cost as little as $20 and connect to the USB port on your laptop or as much as $500 and offer patented "air-multiplier technology." With so many options on the market, Techlicious set out to find the best. We looked for whole-room models and focused our search on ultrasonic models that can disperse either warm or cool mist into the air using the same machine. We also wanted humidifiers that were easy to fill, claimed they could run for 24 hours on a single tank and could serve a medium to large room of 300 to 900 square feet. We looked for advanced features like a programmable humidistat or hygrometer, a digital display screen and a low water indicator or emergency shut-off function. We reviewed each model’s overall design, ease of use and cleaning, customer reviews and independent lab results. With our criteria in mind, we tested the Boneco (Air-O-Swiss) Ultrasonic Humidifier 7147 ($154.99 on Amazon), the Crane Digital Warm & Cool Mist Humidifier (EE-6902) ($129.99 on Amazon or $149.99 on bestbuy.com) and the Vornado Ultra1 Ultrasonic Humidifier ($177.62 on Amazon). The Crane EE-6902 surpassed the competition to deliver excellent humidifying throughout our testing with features like warning lights, a broad timer function, a remote control and built-in air freshener. The least expensive of the trio, it also kept our bank accounts happy, as it didn’t require any additional replacement parts to keep it working all season long. Here’s a look at how the Crane Digital Warm & Cool Mist Humidifier became the Techlicious choice for best room humidifier. The Crane Digital Warm & Cool Mist Humidifier is approximately 10 inches long by 9 inches wide by 14 inches high. It has a 1.3-gallon removable tank accented in black and white, and it is designed to humidify up to a 500-square-foot room. The Crane EE-6902 was a breeze to operate. The digital screen's large numbers made it easy to glance at the readings from afar, and the corresponding button icons were easy enough to interpret that I didn’t need to check the handbook for help. The 360-degree mist nozzle doesn’t actually allow for the mist to disperse a full 360 degrees at once. Instead, the nozzle can be turned in any direction, but the mist disperses within a 90-degree area. One of the other units we tested, the Boneco (formerly Air-O-Swiss) 7147, looks a bit like a stunted coffee maker. The removable, translucent black tank holds 1.5 gallons and sits on opaque black base. It is roughly 10 inches by 10 inches by 12 inches, and it’s designed for rooms up to 600 square feet. Its display screen has large readouts like a digital alarm clock, in orange rather than a more traditional blue. Two nice features on this model are dual nozzles you can point in opposite directions and a sleep timer, which is set to six hours and warm or cool mist, depending on the time of year. Its translucent tank makes it easy to see how low the water level was without having to slosh the water around and guess like I had to with the Crane EE-6902 and Ultrasonic Ultra1 models, whose tanks are more opaque and only slightly transparent when you shine a bright light on them. Optimal humidity levels vary among humidifiers. To maintain comfortable humidity levels in your own home, look for a machine that humidifies in the 30 percent to 60 percent range, with maximum comfort typically hovering around 40 percent to 45 percent. If your humidity level exceeds 60 percent, you may be in danger of growing mold. 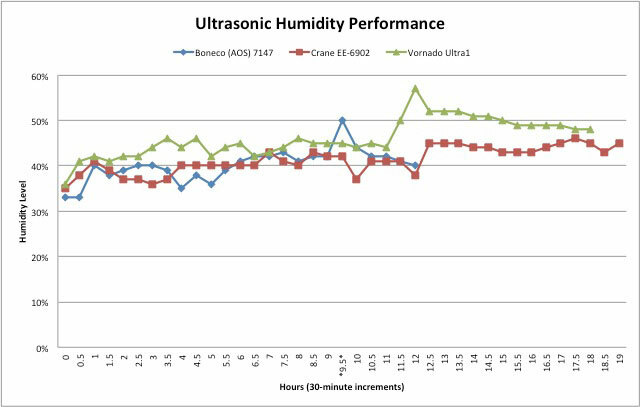 The ultrasonic models I tested take the guesswork out of the equation, limiting humidity levels to the optimal range even when the machine is set to run continuously. 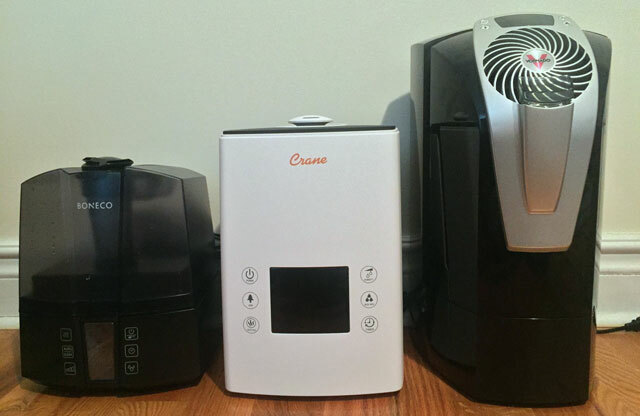 To see how well the machines could humidify a room at ideal levels, I tested them one by one in my 300-square-foot living room (a close match to what the National Association of Home Builders calls an average-sized living room at 330 square feet). I closed all of the windows and ran the humidifiers at their highest mist levels on continuous mode until the the tanks were empty. I recorded the humidity levels every half hour, comparing each machine’s internal readings to that of an external humidity monitor, the Honeywell Humidity Monitor HHM10 ($14.99 on Amazon), which has an accuracy rate of plus or minus 5 percent. As you can see in the chart below, all three models were able to maintain humidity levels within the prescribed range. The Boneco (AOS) 7147 and Crane EE-6902 models should be placed on an elevated surface such as a coffee table, at least three feet above the floor for the Boneco and two feet for the Crane. This ensures the mist doesn’t fall to the ground too soon and dampen your floors. The Vornado Ultra1 is designed to push air up out of the machine and can be placed on the floor. To test run time, I ran the humidifiers on their highest mist settings in continuous mode, which isn’t the ideal operation by any manufacturer's standard. (Ideal conditions according to manufacturer specifications usually means the lowest output.) The Boneco (AOS) 7147 has a 1.5-gallon tank and claims to run up to 24 hours, but it sputtered to a stop after just 12 hours. The Vornado Ultra1 also touts a 24-hour run time on its titanic 2-gallon tank and ended up lasting 18 hours.The Crane EE-6902 has a smaller 1.3-gallon tank and also says it can last up to 24 hours; it lasted the longest, about 19 hours. When it came to ease of use and run time, the Crane Digital Warm & Cool Mist Humidifier received top marks. The Boneco (AOS) 7147 was equally easy to operate, but its larger tank (1.5 gallons compared to the Crane’s 1.3 gallons) lasted seven hours less than the Crane’s. And the Vornado Ultra1’s massive 2-gallon tank ran for 18 hours. One benefit of ultrasonic humidifiers is they don’t require noisy fans. Instead, they use high-frequency sound waves to vibrate the machine’s diaphragm, which breaks down the water into microscopic particles — a visible mist. I wanted to see if the quietness claims rang true. I turned each machine on to its highest output level on cool mist and recorded the sound levels, or decibel levels, using dB Volume (free on iOS) on my iPhone 6. Since ultrasonic humidifiers are considered the quietest models on the market, I tested these machines up close at just one foot away. The Vornado Ultra1 was almost as loud as your average refrigerator, humming in at 39dB on its highest setting and 31 on its lowest setting. That’s way too loud for ultrasonic models, which are marketed as ultra-quiet. (For comparison, a whisper is around 30dB, a refrigerator is at 43dB, and a blender is 85dB.) Both the Boneco (AOS) 7147 and Crane EE-6902 came in about 23dB to 24dB on its highest and lowest settings. No matter which type of humidifier you use, expect some maintenance costs. Ultrasonic humidifiers typically use demineralization cartridges to remove water impurities and/or hydro cells to trap and kill bacteria before they're dispersed into the air. The Vornado Ultra1 and the Boneco (AOS) 7147 use mineral cartridges that need to soak in water for 24 hours prior to their first use. The cartridges are designed to filter the water and remove large particles and minerals, similar to a filtered water pitcher. The cartridges are especially useful if you have hard water because they’ll filter out more impurities. Instead of using mineral cartridges, the Crane uses built-in filter beads that are washable and never need to be replaced, according to Crane’s customer service department. The Boneco (AOS) 7147 humidifier requires both a cartridge and hydro cell. The hydro cell is sold in a pack for $19.99 and should be replaced every one to two months depending on the water quality. The AOS 7531 replacement cartridge is $14.99 and should be replaced every two to three months. The Vornado Ultra1 also requires a cartridge that should be replaced every 800 hours or roughly every two to three months. The Vornado MD1-0018 replacement cartridge is $12.97. The Crane EE-6902 doesn’t require any replaceable accessories to operate. Instead, it has pearl-sized filter beads housed in the tank cap that should be washed once a week. In terms of maintenance costs, the Crane Digital Warm & Cool Mist Humidifier pulls ahead with no extra costs. The Boneco (AOS) 7147's replacement costs are potentially astronomical at $145 a year with continual use. You could purchase a second Boneco at that price! The Vornado Ultra1 is more manageable with just $39 in replacement parts annually. Your humidifier should be easy to fill and clean. The tank should be compact enough that it can fit under the kitchen faucet for easy filling, while its sides should rest flat (or near flat) in the sink so you don’t risk spilling the contents everywhere with a balancing mishap. And when it comes to cleaning it, look for a tank with a large mouth to make accessing the inside easier for cleaning. The Crane EE-6902 falls short in the wide opening department. It has a relatively small tank mouth of just 1 ⅞ inches wide. Both the water tank and base should be cleaned weekly using a solution of vinegar and water and left to air dry before its next use. To scrub inside the tank, use a pot cleaning brush or crushed ice to help remove trouble spots. It doesn’t get much simpler than that. The Crane’s base is built using antimicrobial materials that help reduce bacteria and mold growth up to 99.96 percent. The Boneco (AOS) 7147 has a generous-sized tank opening of 3.5 inches in diameter that makes it easy for those with small hands to reach inside to scrub away mineral buildup. A built-in cleaning reminder activates every two weeks, and it comes with a tiny cleaning brush that should be used weekly to clean the base of the machine. The manufacture only recommends cleaning and descaling the humidifier using its own agents, EZCal A7417 ($7.99 for three, one per use, on Amazon) or EZCal Pro A100 for a deeper cleaning ($9.99 per bottle, per use, on Amazon). The company claims other cleaning solutions will damage the machine, and if you don’t use these cleaning agents, the warranty is considered void. The Vornado Ultra1’s tank opening is also 3.5 inches wide, making it easy to reach inside to clean. It has a pint-sized cleaning brush, built-in cleaning reminder and a replace mineral cartridge notification. The cleaning notice displays after 400 hours of operation (roughly 17 days if you're running it 24/7), and the cartridge reminder turns on after 800 hours, roughly 33 days when you’re running it 24/7. But you don’t need expensive cleaning agents to refresh the machine. A solution of white vinegar and water will do, or if you forget to clean it for a couple of days, disinfect it with a bleach-and-water mix. That said, it’s still a pain to fill and clean, as the 2-gallon tank is hard to fit in a kitchen sink. A recent study from Consumer Reports found you should really be cleaning your humidifier on a daily basis. Rinse and dry daily, and disinfect and descale weekly. Researchers determined that after just three days of continuous use, microbial growth was present in most humidifiers, and all ultrasonic models tested released some airborne bacteria. Follow manufacturer directions and empty the water tanks between use and clean and disinfect them regularly. While there’s a benefit to being able to choose between cool and warm mist settings, this feature may not be useful for everyone. Because warm mist humidifiers heat the water in the tank in order to produce warm mist, small children and pets may be at risk of scalding themselves if they’re too close to the mist when it’s released from the humidifier. And as some ultrasonic models should be placed on an elevated surface, even adults risk stepping into the path of a hot mist stream. Be mindful where you position your humidifier to minimize this risk. In my test, I ran the humidifiers on warm mist at the 9.5-hour mark for 30 minutes. While I could tell there was a difference in humidity output levels over that period of time (humidity readings slightly dropped), I didn’t notice much of a difference in the “warmth” of the actual mist. All manufacturers stated it takes 10 to 20 minutes for the warm mist function to work and that it only changes the temperature by a couple of degrees. So if your humidifier is working properly, it’s highly unlikely you’ll burn yourself if you get too close. Just make sure it’s out of reach of your pint-sized loved ones. With that, families should look for a built-in sensor that tells you when the tank is low or empty and reminds you to refill it with an indicator light or beeping sound. Some models even go as far as turning themselves off when they detect there’s no more water to dispel into the air. Among our test models, all three have refill tank indicators, but only the Boneco (AOS) 7147 and Crane EE-6902 actually shut themselves off once they detect the water level is too low. If you try to turn them back on, the low tank indicator light comes back on, but you can’t operate the machine. The Vornado Ultra1 has the low tank notification, but it won’t turn itself off; despite two hours of running on an empty tank, it just kept chugging along like the Energizer bunny. If you’re keeping the humidifier in a child’s room or want to run it without supervision, play it safe and opt for the Boneco (AOS) 7147 or Crane EE-6902, since they both have automatic shut-offs. The Crane Digital Warm & Cool Mist Humidifier averages 3.6 out of 5 stars on BestBuy.com, with complaints surrounding the inability to see the water level in the tank. It does come with a water level sensor, so we gave Crane EE-6902 a pass on this one, but the sensor beeps somewhat loudly three times, which could be a problem for light sleepers. (It wasn’t a nuisance to me.) Consumer Reports reviewed five Crane models with an average score of 80/100. If you have any problems of your own, the Crane EE-6902 comes with a one-year warranty. The Boneco (AOS) 7147 comes with a three-year limited warranty, and the Vornado Ultra1 comes with a five-year limited warranty. The Vornado Ultra1 is the largest model out of the group, but its size didn’t mean it outperformed its smaller competitors. In the end, the tank was a hassle to fill, the machine lacked an auto shut-off function when empty, it had sticky buttons and display screen issues, it lacked directional nozzles, and it made a racket in the noise department. 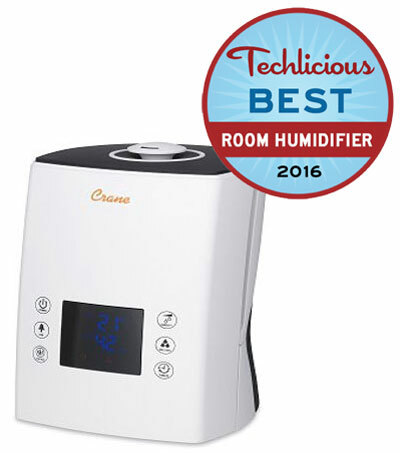 The Crane Digital Warm & Cool Mist Humidifier (EE-6902) surpassed the competition with its “whisper-quiet” mist function, 10 programmable settings, 360-degree nozzle and impressive 19-hour run time. The unit requires no ongoing maintenance costs, and its base is made of antimicrobial materials, so you won’t have to clean it as often as other humidifiers.